Today's Draw: Four of Pentacles from the Cephalopod Tarot by Kitsune. What kind of decisions do you make for money? What role does money play in your life? And is it possible that you could actually live a better life with less? Tthe Four of Pentacles is usually about holding on too tight to money. We could use this card to talk about how holding on too tightly to money stops the flow of it in our lives. On the heels of yesterday's post, we could talk about fears of not having enough money. It's definitely the card of the miser. And, in some ways, the card of spending wisely. Or you can extrapolate it to mean holding on too tightly to pretty much anything...a resistance to change, for example. So many of those topics are where we've been hovering for the past couple of weeks. But today, it occurred to me that this card—this cephalopod—is making everything about money. He's not noticing the cool rush of salt water past his tentacles. He may not see a predatory sea lion approach from the rear. Nor is he spending time wooing his lady-pus. It's all about the money. He's preoccupied with money! It would be short-sighted to call him greedy. It would also be short-sighted to pretend you're separate from the phenomena. Most who read this were raised in a capitalist society. And in that society, money comes first. What working parent hasn't been torn between work and home, for example? Who hasn't ever made a decision based largely on monetary considerations? Who hasn't denied themselves sort of pleasure somewhere along the line, either because they didn't want to spend the money or didn't want to take time away from earning it? It's a sad fact of today's super-sized lifestyles that money becomes our #1 preoccupation, ahead of all the other things that fuel us, like family, friends and personal interests. Whether we're the earners of that money or the ones that have to budget the spending, it's a major cause of stress in our lives. And yet, as long as we have food in our stomachs and a roof over our heads, there's always enough, right? So the question becomes, "why can't we trust that?" And then it's followed with, "what is this all really about anyway?" I know that whenever I've made decisions in my life based on money, they've turned out to be unwise and unhealthy decisions. And I often feel like I focus so much on my career that I don't really experience the lifestyle that career was meant to afford me. To be clear, I do derive pleasure from my career and it's an essential part of who I am, but the focus becomes overwhelming, not just because I love to write, but because I love to write for MONEY...haha. I can't imagine what it would be like if I had humans at home to nurture and care for. As it is, I feel guilty about how much I push aside my dogs for business and I work at home alongside them! So, whatever. 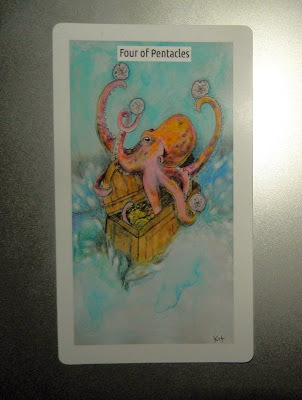 Tonight the Four of Pentacles (or is that Tentacles?) is making me think of my own attachment to money and a certain lifestyle, as well as the decisions I make to bring or not bring money into my life. We need it to live, but what kind of life does it afford us when our lives become heavy on the "stuff" and light on the substance? What a beautiful sentence: when our lives become heavy on the "stuff" and light on the substance?.I've been thinking on letting go recently, not only stuff, but also habits and so on.